British Prime Minister Theresa May on Thursday held a series of meetings with disgruntled anti-Brexiteer MPs from her Conservative Party who are believed to be on the brink of following three of their colleagues to split from the party. Former education secretary Justine Greening and former justice minister Phillip Lee were among those seen going in for talks in Downing Street, in what is seen as May's effort to counter allegations that she gave more time to the pro-Brexit wing of the party and curb the latest rebellion brewing within her ranks. "I don't think I would be able to stay part of a party that was simply a Brexit party that had crashed us out of the European Union," said Greening, who said she had considered joining fellow Tory MPs Anna Soubry, Heidi Allen and Sarah Wollaston in quitting the party but had decided to stay for the moment. The anti-Brexit trio, who favour a second referendum on Britain's membership of the EU, had announced their resignation from the Conservative Party on Wednesday. They joined a newly-formed Independent Group, created by eight former Opposition Labour Party MPs unhappy with their own party's Brexit and other policies. The group now add up to 11 MPs, same as the Democratic Unionist Party (DUP) which provides the May government with a crucial number to make up her majority in the House of Commons. Philip Lee, who quit as a justice minister over Brexit, had been named as a potential future defector to the Independent Group. Lee's Right to Vote group said he had discussed the campaign's calls for a pause in the Brexit process and a possible second referendum during his meeting in Downing Street. "Talks were open and we are encouraged she listened to our case," the group said. Disgruntled former minister, Dominic Grieve, is another Tory MP believed to be on the edge of resigning from the ruling party over fears of a no-deal crash-out of the EU if an agreement is not reached in time for the March 29 Brexit Day deadline. "I would certainly cease to take the whip (party orders) if I thought the government was about to take us into a no deal Brexit," he said. Meanwhile, the British PM held her latest round of talks in Brussels with European Commission President Jean-Claude Juncker on Wednesday. In a joint statement released afterwards, the two leaders said they had held "constructive" talks on "which guarantees could be given with regard to the backstop that underline once again its temporary nature". 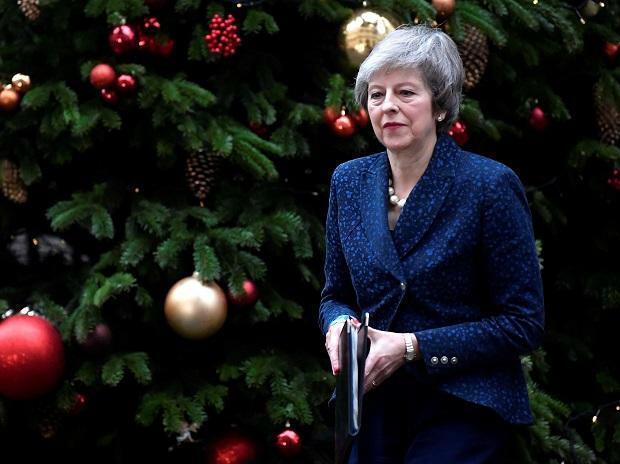 May has promised to give the House of Commons some form of vote on Brexit by February 27 but is under heavy pressure from pro-EU ministers to put a revised deal before Parliament and rule out a no-deal Brexit. The government is hoping that a so-called "meaningful vote" could happen by the end of February if talks with the EU go well. If not, MPs would be given a debate over what should happen in relation to Brexit and would vote on an amendable motion. A majority of MPs are expected to use that opportunity to try to pass a plan that would force the government to hold a vote on extending Article 50 beyond the March 29 deadline if no deal is in place by mid-March. "If we do not have a meaningful vote next week there will be another amendable motion tabled which will allow the House of Commons to once again debate how it wants to go forward," confirmed UK Chancellor Philip Hammond. Britain's Brexit secretary, Stephen Barclay, and Attorney-General Geoffrey Cox went back for a fresh round of talks with EU chief Brexit negotiator Michel Barnier in Brussels on Thursday. May is then set to travel to an EU-Arab League summit in Sharm el Sheikh, Egypt, on Sunday to hold further talks with EU leaders.